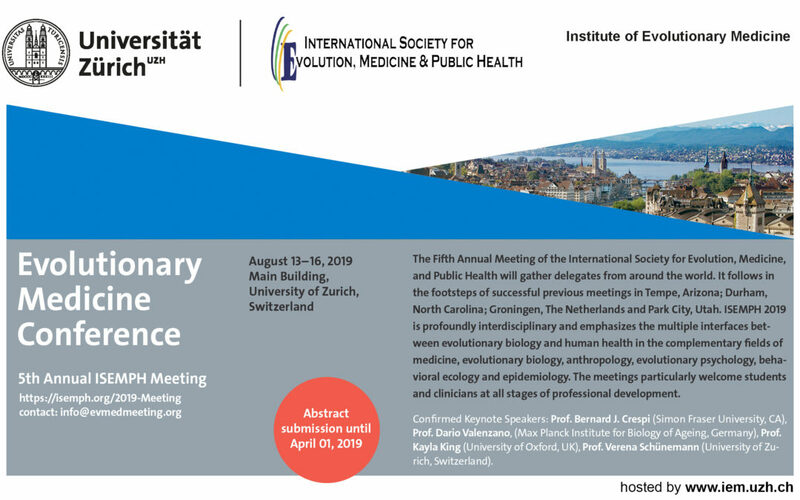 Abstract submission and registration are now open for the 5th annual meeting of the International Society of Evolution, Medicine and Public Health August 13-16 in Zurich, Switzerland. ISEMPH 2019 is profoundly interdisciplinary and emphasizes the multiple interfaces between evolutionary biology and human health in the complementary fields of medicine, evolutionary biology, anthropology, evolutionary psychology, behavioral ecology and epidemiology. This meeting will particularly welcome students and clinicians at all stages of professional development. Full information and registration links are here. May 31 is the deadline for discounted early bird meeting registration. Register now to ensure getting a spot; if your plans change you can cancel and get a refund. The meeting his hosted by the Institute of Evolutionary Medicine at the University of Zurich and a committee chaired by Frank Rühli and Nicole Bender. Medicine is grounded in the natural sciences, among which biology stands out with regard to the understanding of human physiology and conditions that cause dysfunction. Ironically though, evolutionary biology is a relatively disregarded field. One reason for this omission is that evolution is deemed a slow process. Indeed, macroanatomical features of our species have changed very little in the last 300,000 years. A more detailed look, however, reveals that novel ecological contingencies, partly in relation to cultural evolution, have brought about subtle changes pertaining to metabolism and immunology, including adaptations to dietary innovations, as well as adaptations to the exposure to novel pathogens. Rapid pathogen evolution and evolution of cancer cells cause major problems for the immune system to find adequate responses. In addition, many adaptations to past ecologies have turned into risk factors for somatic disease and psychological disorder in our modern worlds (i.e. mismatch), among which epidemics of autoimmune diseases, cardiovascular diseases, diabetes and obesity, as well as several forms of cancer stand out. In addition, depression, anxiety and other psychiatric conditions add to the list. The Oxford Handbook of Evolutionary Medicine is a compilation of cutting edge insights into the evolutionary history of ourselves as a species, and how and why our evolved design may convey vulnerability to disease. Written in a classic textbook style emphasising physiology and pathophysiology of all major organ systems, the Oxford Handbook of Evolutionary Medicine will be valuable for students as well as scholars in the fields of medicine, biology, anthropology and psychology. It has a clear structure which makes this volume easily accessible for students and scholars. Also it has over 130 colour images; this book illustrates beautifully the topic of Evolutionary Medicine. With chapters divided into ‘General topics’ and ‘Specific Organ Systems’, readers are able to understand both the relevant evolutionary background information and the application to physiological systems. Advanced Module “Evolutionary Medicine”: The 1-month interdisciplinary block course “Evolutionary Medicine” aims to train MSc students in the application of evolutionary principles to the understanding of health and disease. Topics include, e.g., the evolution of resistance of bacteria, evolution of disease-relevant genes, genome-wide association studies or the evolution of transposable elements. The course comprises both lectures as well as hands-on practical work in the lab. The University of Münster offers a wide range of research opportunities for PhD students in the field of Evolutionary Medicine. Research work to obtain a PhD degree (Dr. rer. nat.) from the Faculty of Biology can be done in one of the labs of the Faculty of Biology or the Faculty of Medicine, including the University Hospital Münster (UKM). The Research Training Group Evolutionary Processes in Adaptation and Disease (EvoPAD) is a structured programme for doctoral students funded by the Deutsche Forschungsgemeinschaft (DFG). EvoPAD unites biological, medical, and philosophical research with the core idea to use the theory of evolution to understand processes leading to adaptation and/or disease. The programme focusses on three core research areas: (A) Evolutionary processes in infectious diseases, (B) Plasticity of genomes and phenotypes and its relevance for health and disease, and (C) Philosophy of evolution and disease. The Münster Graduate School of Evolution (MGSE) is an institutionalized, interdisciplinary association of researchers at the University of Münster, bridging the faculties of geosciences, biology, medicine, mathematics, and philosophy. The MGSE provides an interdisciplinary network of excellent scientists working on diverse topics in evolution and a study programme for doctoral students of the different faculties in the general field of evolution. The programme, as well as a specific mentoring system ensure interdisciplinary networking. The doctoral students of the MGSE address a broad range of questions, from the evolution of earth to the evolution of evolutionary theory. The Master of Science in Molecular Biology and Evolution (MAMBE) is an international program, taught entirely in English, and it is based on the fruitful collaboration between Kiel University and the Max-Planck-Institute for Evolutionary Biology in Plön. Together with further collaborations (with the Leibniz Science Campus EvoLUNG (Evolutionary Medicine of the Lung), and also the Collaborative Research Centre 1182, Origin and Function of Metaorganisms), it specifically combines the areas of evolution and molecular biology – a combination which has emerged as an extremely successful interdisciplinary research field in recent years but has not yet been available in academic education. The MAMBE curriculum is founded on the idea that interdisciplinary thinking enhances in-depth understanding of biological phenomena and also applied medical problems (e.g., Evolutionary Medicine). For example, the complexity that are characteristic for many molecular processes, including those underlying human disease, can often only be understood by taking into account their evolutionary origin. Similarly, the evolution of particular traits, including those underlying virulence or antibiotic resistance of human pathogens, may also often depend on the underlying molecular mechanisms. MAMBE will foster such interdisciplinary connections. In the first two semesters, students will learn about the basic mechanisms and processes of molecules and evolution. Additionally, they will enhance their skill set in scientific communication and management (e.g., preparation of seminar talks, or writing of grant applications, etc). During the third semester, the acquired competences will be applied to real research life in the laboratory and field. The fourth semester will consist of the Master thesis. The Master of Science in Medical Life Sciences is hosted by the Medical Faculty of Kiel University, coordinated by the Institute for Clinical Molecular Biology (IKMB). Translational medical research “from bench to bedside” is one of the fastest growing fields, the demand for experts is growing more rapidly than can be currently met. Scientific results gained in cell biology, genetics, microbiology, molecular biology, biochemistry, and also evolutionary biology need to be translated into medical applications before they can be utilized for the benefit of people, e.g. in disease prevention and therapy. The curriculum has four focus areas: Evolutionary Medicine, inflammation, oncology, and longevity. The focus area on evolutionary medicine looks at the dynamic interrelations between environmental factors and the human genetic make-up that influence the development of and susceptibility to diseases. Why do we suffer from chronic conditions such as diabetes, heart disease or obesity? Why are certain genetic variants maintained within populations despite their disease risk? Why do pathogens evolve drug resistance and can we take measures against it? Evolutionary medicine aims to bridge the gap between evolutionary biology and medicine. It focuses not only on a mechanistic understanding of medical conditions, but also considers their evolutionary origins to ultimately help improve innovative research in biomedicine. Max-Planck Insitute for Evolutionary Biology, Ploen; Kiel University, Kiel; Geomar Helmholtz-Center for Ocean Research, Kiel. The International Max-Planck Research School for Evolutionary Biology (IMPRS Evolbio) is an international graduate school dedicated to highest level research and training in all areas of contemporary Evolutionary Biology, including connections to applied fields such as Evolutionary Medicine. The graduate school is embedded in the thriving research environment of Northern Germany. Since 2010, the IMPRS for Evolutionary Biology has been operated by the Max Planck Institute for Evolutionary Biology, the Kiel University and the GEOMAR – Helmholtz Center for Ocean Research. Graduate education is based on individual doctoral research projects and also a training program. The latter includes mentoring by a thesis advisory committee (TAC) as well as an individually coordinated curriculum of regular lab and soft skill courses, workshops or seminars. The training is supplemented by scientific presentations at our annual IMPRS retreat or by attending conferences. The doctoral thesis and its funding by the IMPRS is designed for three years. English is the official language within our graduate school, German beginner courses are offered for foreign students. The Leibniz Science Campus Evolutionary Medicine of the Lung (EvoLUNG) integrates evolutionary theory with lung research to achieve a better understanding of chronic lung diseases such as tuberculosis, asthma and chronic obstructive pulmonary disease (COPD). The campus focuses on three main research topics, including: (1) the spread and evolution of multi-drug resistant pathogens of the lung, (2) the evolutionary origin and possible benefits of disease genes, and (3) the interplay between four key players: disease susceptibility genes, microbiota, pathogens, and abiotic environmental stressors. The long-awaited article on the evolution of obesity and its interactions with the immune system has just been published in PNAS, open access. This may offer a key to the pathogenic effects of obesity via inflammation. to poor maternal/fetal conditions, increasing their vulnerability to inflammatory disease. Approval of an impact factor has just been announced for Evolution Medicine and Public Heath, the Open Access journal published by the Oxford University Press for the International Society for Evolution, Medicine, and Public Health. This is a major accomplishment for such a new journal, started by Stephen Stearns just 7 years ago. 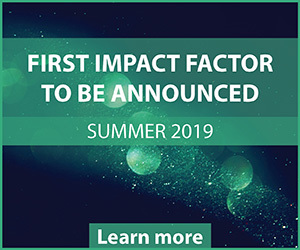 The specific impact factor will be announced this summer. As in previous years, the $5,000 George C. Williams prize is awarded to the best paper in the journal each year. If you’re not already registered for them, you can get “Email Alerts” for EMPH articles. ISEMPH is working with OUP to create a system that sends notifications only when the final pdf version of an article is posted. In the meanwhile, you can create or sign into your free OUP account to specify which of four possible kinds of alerts you want to receive. New Issue Alerts are sent just after a journal issue closes. Since EMPH is organized in annual volumes, this e-alert is sent only once per year for EMPH. In Progress Alerts are sent either daily or weekly and contain any new content that has posted since the prior e-alert. Since EMPH only places corrected proofs in issues, this would probably be the best alert type for most ISEMPH members. Advance Article Alerts are also sent either daily or weekly and contain any new content that has posted since the prior e-alert. (Again, the user gets to select the frequency.) Only accepted manuscripts are placed here. This will get you a notification of all new content as soon as it publishes. Article Activity Alerts can be created by each user, if they would like to be notified about any subsequent activity related to a specific manuscript – comments, errata, etc. This is different than Saved Searches, which can also be created by users.